Former First Minister of Scotland Alex Salmond has denied he would use a successful bid for a seat in the House of Commons in May to gain a second Scottish independence referendum. In an interview with a Scottish newspaper, the former leader of the Scottish National Party (SNP), who will stand for election as an MP in May’s General Election, said his priority was to make the UK deliver “real home rule” for Scotland. One of the key reasons the independence referendum resulted in a “no” vote was the main Westminster parties’ pledges of greater devolution to Holyrood, Salmond argued. The Conservative Party accused Salmond of being a “reckless back seat driver,” who was attempting to gain independence via the “back door” of Westminster. In the interview, published in The Courier and the Press & Journal, Salmond emphatically stated that he would not use a seat in Westminster to rally for another referendum. 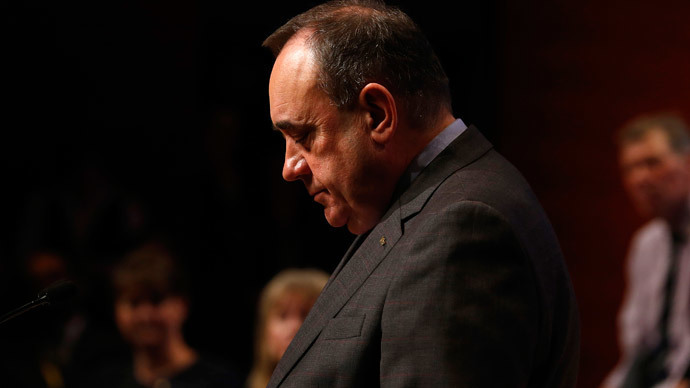 “We are not campaigning for a second referendum – we've had a referendum,” said Salmond. He claimed there was “massive evidence” that Scotland was in support of independence, which he defined as “home rule, devo-to-the-max or near-federalism,” including domestic matters and taxation, leaving only foreign affairs and defense to Westminster. He also said the SNP needed a strong presence in the UK parliament to defend the interests of Scotland. “This Westminster election is about delivering to Scotland what was promised in the referendum and the things that people are entitled to see,” he added. In the final days leading up to the independence referendum, the “Better Together” campaign, backed by Scottish and English celebrities and political figures alike, pledged a significant devolution to Scotland in return for a “No” vote. Salmond has previously said the English need their own referendum to decide the way they ought to be governed, suggesting that the country should vote to abolish the House of Lords. In December last year, the Smith Commission suggested Holyrood be given new powers in Scottish finance and other areas. The commission was set up by Prime Minister David Cameron to explore the ways Scottish devolution powers could be increased and implemented. Its findings will be used to form the basis of devolution legislation. The SNP, however, said the proposed measures weren’t enough. The backlash against Salmond comes only one day after a senior civil servant claimed that the formation of a new coalition after the 2015 General Election would be even harder than it was in 2010. Speaking on BBC Radio 4’s Today program on Thursday, Lord O’Donnell warned that forming a future government could take a similar timeframe to those of coalitions in mainland Europe.